Over the years, we have grown tremendously. 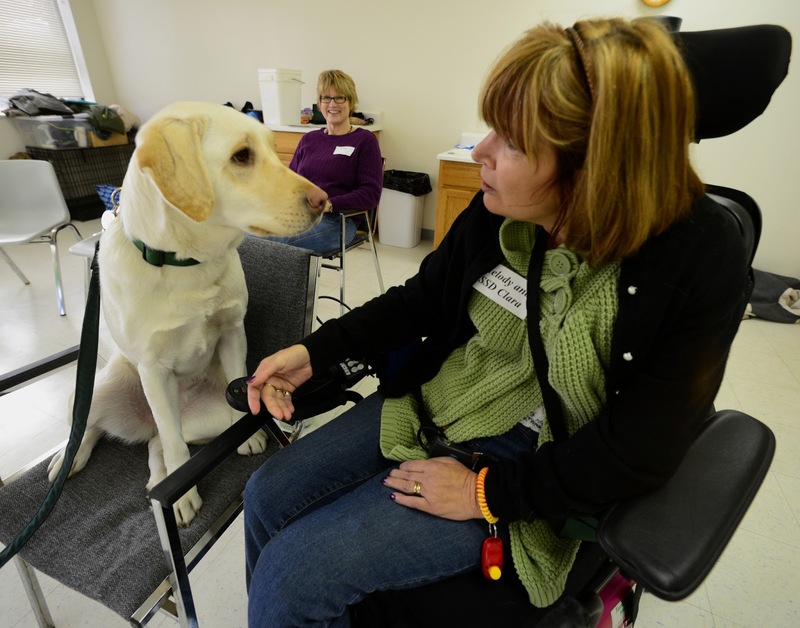 What started in 1993 with a small group of volunteers has grown to a large network of staff and volunteers working together to raise and train service dogs for people with disabilities. Now we are looking toward the future and developing a plan to continue growing and improving our program so we can change even more lives with the assistance of our dogs. 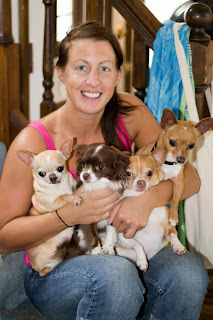 As many of you know, we have a breeding program here at SSD (please see our post Why Do We Breed Service Dogs? for our reasoning behind this choice). Recently, we hired breeding consultant Marina Hall Phillips to help us evaluate our breeding program and examine other areas of our entire program so we can make sure we’re doing the best we can to provide successful service dogs for men, women, and children with disabilities. 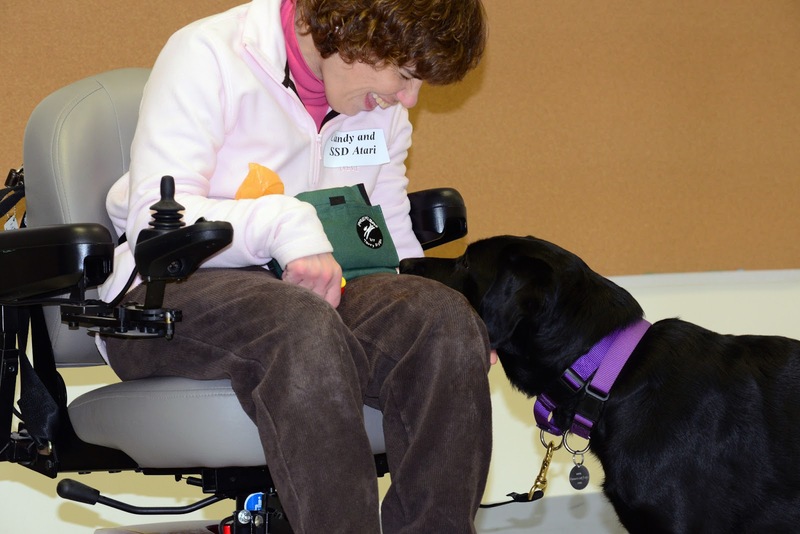 Marina has worked with Canine Companions for Independence and Guide Dogs for the Blind, and she has many years of experience with service dog breeding programs. We have every confidence that she’ll help us make successful changes! Last night, a group of our volunteers met with Marina to discuss their volunteer experiences with SSD and the breeding program, as well as our program’s overall strengths and weaknesses. In true SSD fashion, we followed this discussion with a potluck dinner. While our volunteers were talking with Marina, our staff made sure all the food was cooked or heated. From the honest discussion our volunteers had with Marina, we hope to improve not only our breeding program, but our entire program. We have a small staff, so we rely on our volunteers to do a lot. When we tell our volunteers that we couldn’t do it without them, we truly mean it! Our volunteers raise puppies, help us train our advanced training dogs in public, whelp litters, care for our breeding dogs, puppy sit, do therapy visits with children with autism, give demonstrations, do home visits for potential partners and puppy raisers, help with Meet the Dogs and Team Training—the list goes on and on. As we develop our plan for the future, we imagine that many of the improvements will result in an improved volunteer experience. All improvements mean that we will be able to provide higher quality service dogs that are well-suited to working with their partners. And that means that means that more lives will be changed. 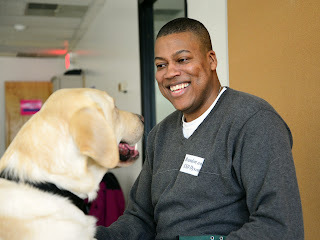 If you’re interested in joining Susquehanna Service Dogs as a volunteer, please apply online. We would love to have you join us! Like his namesake, Father Mychal Judge, SSD Judge is happy to serve others. This sweetheart loves people and loves to work! Judge is from the American Heroes litter, born on May 2, 2011, and he’s currently in advanced training. When he returned to his puppy raisers, Donna and Jim, for the weekend, they were impressed by how quickly he moved into the heel position and how he closely watched his handler while loose leash walking. In January, he and his puppy raisers traveled to New Jersey for his puppy raisers’ grandson’s first birthday. There were about forty people of all ages there, and it was crowded and loud, but Judge stayed in a down-stay and fell asleep. His puppy raisers also took Judge to Cape May, where they visited the shops, the beach, and restaurants. Judge’s favorite toys are sticks and Jolly Balls, although now that SSD Irwin has joined the family, he likes any toy that Irwin has! Judge loves food. In fact, he won the Clean Plate Club Dog Olympic Game at PawsAbilities twice last year! His favorite foods, however, are fruits and vegetables. Since Judge grew up on an orchard, it should come as no surprise that he trains best with apples as treats. Judge loves helping on the orchard. When Donna and Jim were marking the location of posts and trees, Judge really wanted to help. He kept picking up the flags, so Donna gave them to him to carry. He was one happy boy! Judge just wanted to help out on the orchard. Because he loves food so much, learning the cue “leave it” was a challenge, but he has mastered it. In fact, Judge can now ignore food so well that he falls asleep right next to it! He can’t help drooling when he walks past food, though. Judge fell asleep while ignoring some of his favorite foods on the stool. He's been ignoring the food for 30 minutes! Besides “leave it,” Judge has found greetings to be challenging. But as often happens, his puppy raiser found the key to nice, calm greetings, thanks to some advice from a veteran puppy raiser. Instead of having the person greet Judge, Donna asked the person to greet her. While they talked and Donna explained about Susquehanna Service Dogs, Judge remained in a calm “sit-stay” or “down-stay.” Then, if Donna thought Judge would be able to handle it, she let the person greet him. This is an excellent example of setting a dog up for success! Judge has also learned to greet other dogs calmly. He and his littermates used to get very excited to see each other, but at last year’s Highmark Walk for a Healthy Community, he and his brothers and sisters were able to walk next to each other calmly. L to R: Ripley, Judge, Hale. Now Judge is waiting to be matched with his partner. Did you know that the Ultimate Air Dogs are coming to PawsAbilities? We couldn't be more excited! You and your dog can compete in the Splash competitions (long jump into a pool), or if you're new to dock jumping, you and your dog can practice in between Splash heats. More details are available on www.pawsabilities.net. In addition to Ultimate Air Dogs, you and your dog can also participate in and watch the Dog Olympic Games, the Cutest Dog Contest, the costume contest, parade, agility, and more! You can purchase tickets online or for the first time ever, you can win a pair of tickets! Ellen of the Ask Away Fashion and Advice Blog is giving away two PawsAbilities tickets on her blog. Visit her blog to learn how you can win them! We hope to see you and your dog at PawsAbilities! When: March 9-10, 9 a.m. to 4 p.m.
You tickets are good for both days! Team Training is the moment that our puppies work toward from the moment they’re born. At eight weeks old, the puppies start learning basic cues, like “sit” and “down.” As they grow, their puppy raisers teach them good house manners, take them out in public to get them used to working in different environments and situations, and teach them a variety of other cues. When the dogs are 18-24 months old, they move on to advanced training where they learn more complex cues. They meet several people, make a match, and receive individualized training specifically for that one person. And finally, when their training is complete, it’s time to learn how to work with their new partners. It’s time for Team Training. SSD Atari, SSD Clara, and SSD Dyson are going through Team Training right now. The first moment when our volunteers bring the dogs out to their partners is almost magical. The dog comes trotting toward you, and as you’re petting him or her and giving the dog treats, you know that this is going to be your dog. Since that moment, Atari, Clara, and Dyson have been practicing cues and getting to know each other. They’ve been practicing cues like “visit,” “lap,” opening doors, and picking up items. As they continue to work together, their trust in each other will grow and soon an inseparable bond will be forged. At the end of the two-and-a-half-week Team Training, each team will take the public access test, and then they will officially be working service dog teams! Do you know Stuart? How about Vicki, Ali, Hank, and George? 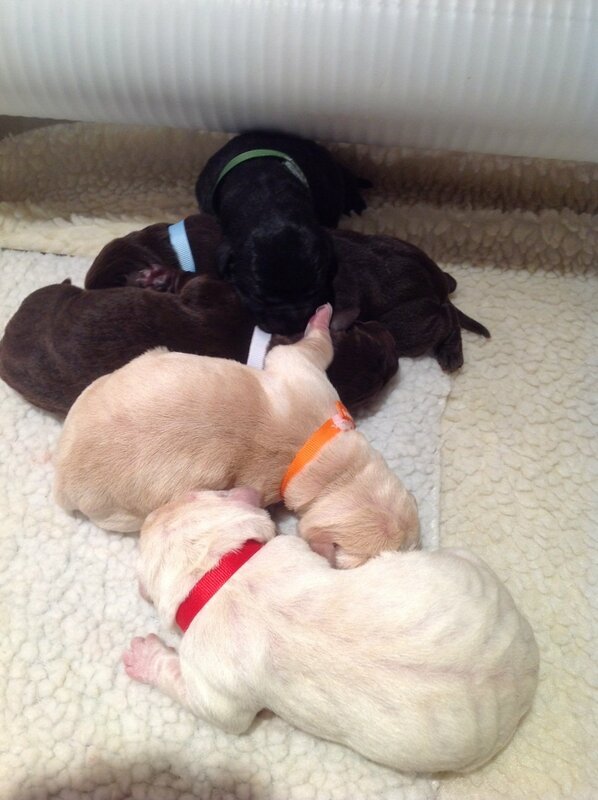 They’re our newest puppies, and you can meet them on the puppy cam! SSD Midge gave birth to the G.B. Stuart Foundation litter on February 7-8. 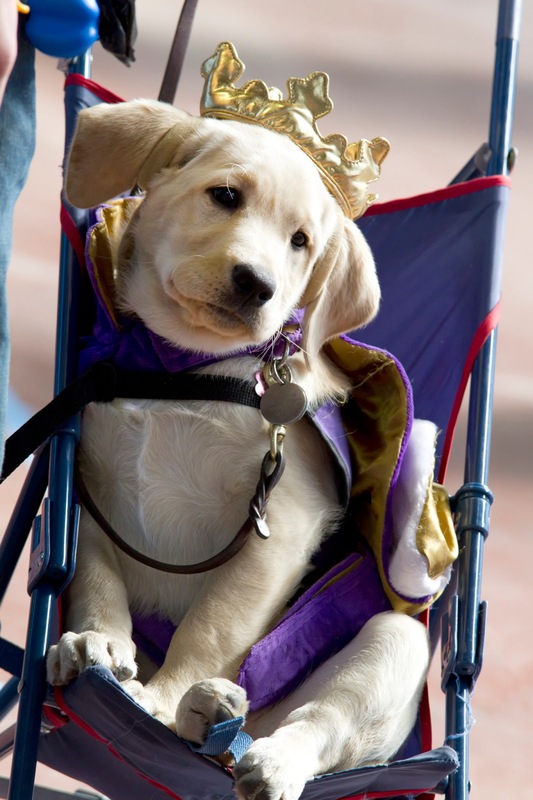 She had been bred to Elton from the Guide Dog Foundation for the Blind. Handsome Elton is also the father of Midge’s Shakespearean puppies. The first puppy, SSD Stuart, was born at 10:38 p.m. on February 7. This black male puppy was followed by a chocolate female named Vicki, a yellow female named Ali, a yellow male named Hank, and a chocolate male named George. These five puppies were named by the G.B. Stuart Foundation, which gave us a generous donation to support our puppies in training. Huge thank to the G.B. Stuart Foundation! 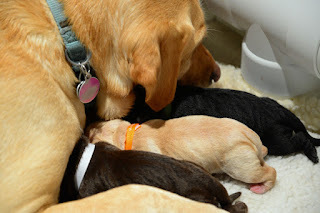 Midge and her puppies are doing great! You can watch them on the puppy cam as they grow and learn about the world. When they’re about four weeks old, you’ll be able to visit them for puppy hugging! If you’re not already on our puppy hugger email list, sign up online so you don’t miss out.